Wanted to pop in real quick to tell you guys about a quilt I just finished for Sewn Studio. 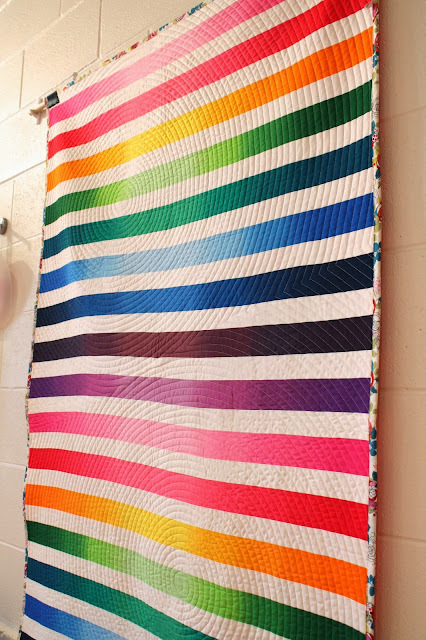 I don't normally share my store samples here with you, but I wanted to let you know about this one because well, I'm excited about it, and because we have kits for this quilt top available for an awesome deal. AND we will ship them if you are interested! I wish I could say I came up with the simple and stunning design, but that was all the boss, Julie. Brilliant! 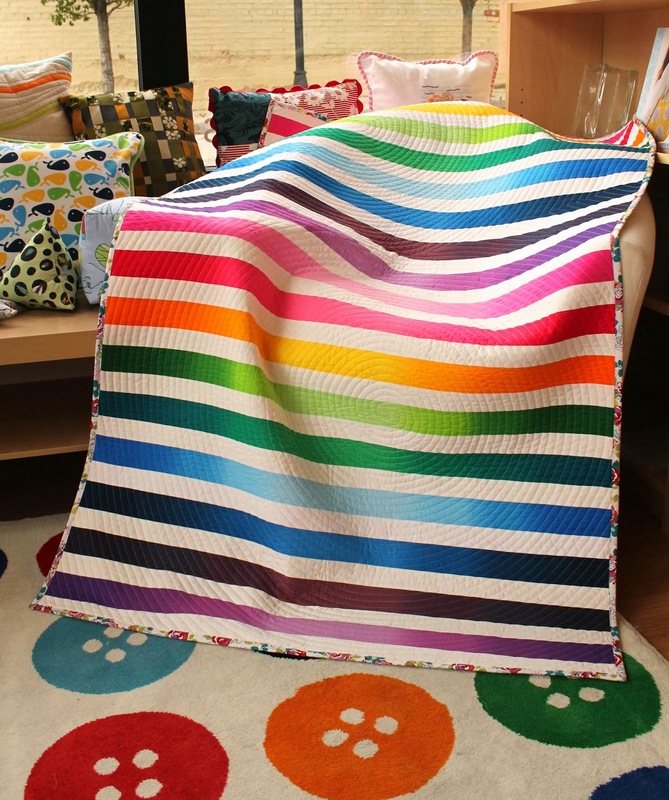 The rainbow ombre strips are cut from Klothworks yardage we just got in, and you won't find these kits any where else. The quilt finishes at about 40" x 66". It's nice that you only need 2 yards of backing and 1/2 yard of binding to finish this one up! 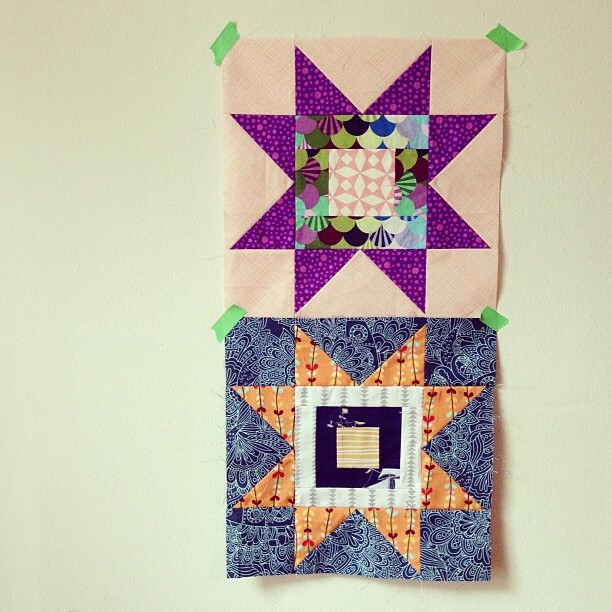 Go to the Sewn Studio blog to read more about the kits and how to order them by phone. ETA: the online shop portion of the website is not running. If you want a kit, just call 513-321-0600 to order. I'll be back tomorrow with another project of my own to share! This 4 year old is too cool for school. And for smiling. He can throw some faces though. 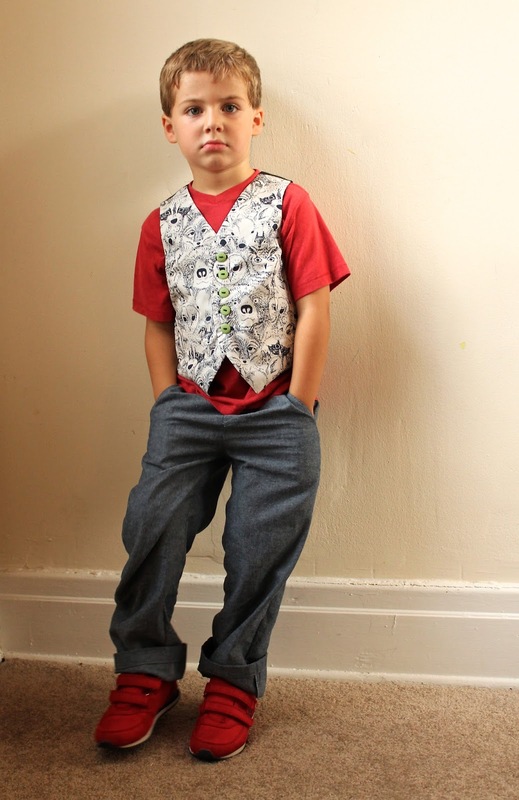 I made this little look for him from the brand new Oliver & S Art Museum vest and trousers pattern, which is fantastic! 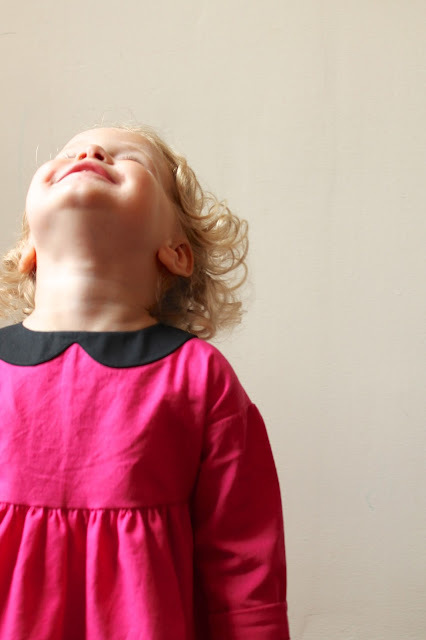 It would obviously be the perfect pattern to buy if you are looking to make a dressy boy outfit for church or a wedding or something, and it's even pretty cute on girls, as some O&S fans have already shown. But we don't really get dressed up too often, so I wanted to find a way to dress it down a little so Hendrix could even wear it to pre-k a lot this fall. And after last fall, when all the fashionable slim fit pants I made him seemed to only last a month or two, I am all for relaxed fit pants. I love the fit on these and so does this very active boy. We're leaving the skinnies to the college kids this fall. I made the pants a size 5, but cut to a 6 length just in case. But after I saw how long they were on him, I cut most of the extra length off anyway. The vest is a size 6 and I love the way it fits over a Target tee. Perfectly light and comfy. I used a fabric I got on my trip to Portland to visit Kristin back in June from an adorable shop there called Cool Cottons. I could have done some serious damage there, but I showed great restraint. Still, this print called Menagerie by Sarah Watson for Art Gallery had to make the cut. It's just too good. 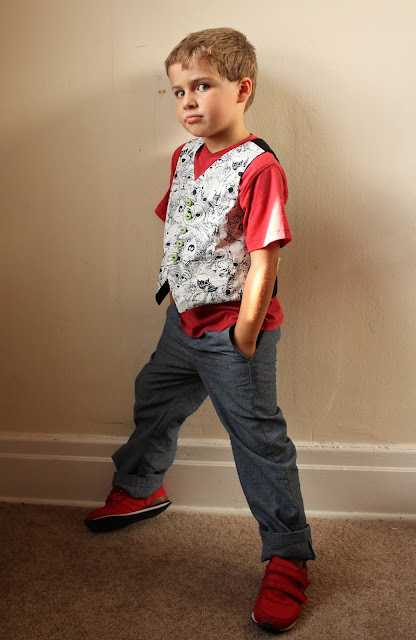 And I think this fun neutral print makes the vest a little more casual as well. 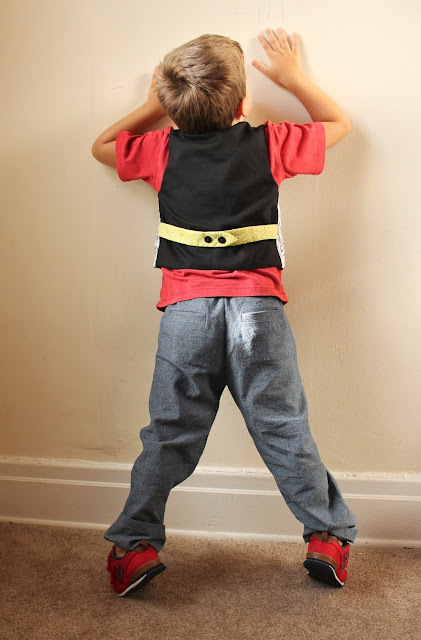 The lining and back of the vest is just lightweight black batiste, but I added a little green contrast on the back belt and inside the pockets and with the buttons. The welt pockets were so fun to make. But, full disclosure, I did sew the inside of the vest pockets a little wrong. Nothing that effects things too much, just misread a part of the instructions and made some assumptions on my own. After talking to friends who were also making this pattern, I realized my errors. Then when I later started on the pants welt pockets, the instructions seemed clear as day and I didn't even know how I had screwed things up before! But really, they are the best welt pockets I've ever sewn, they look flawless on the outside and the pattern does a great job with that part. Maybe just read that whole part through once or twice before beginning. I couldn't get a great picture of the pockets on the pants though because he only wanted to stick his booty waaaaaaay out for that part. This kid was acting like he was appearing in a Sir Mix-a-lot video, so I thought it best to spare you those pictures. I had to tell him to climb the wall like Spiderman instead. A bit awkward, but there comes a time with 4 year old boys when beggars (bloggers) can't be choosers. Over it. But we'll just say this is his angsty model pose. The most important thing is that he loves the outfit and didn't want to take it off. Always a great sign! If you haven't seen them already, be sure to check out the AMAZING Art Museum garments from Cherie, Gail, and Kristin. It's one of those essential patterns if you have a boy you sew for, and a really cute unique pattern to keep around for girls. 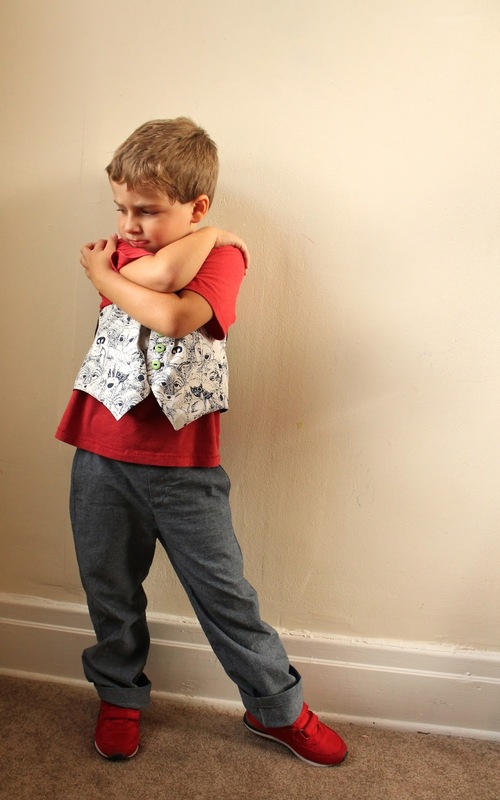 Thanks again to Liesl for letting us sew up these great patterns! 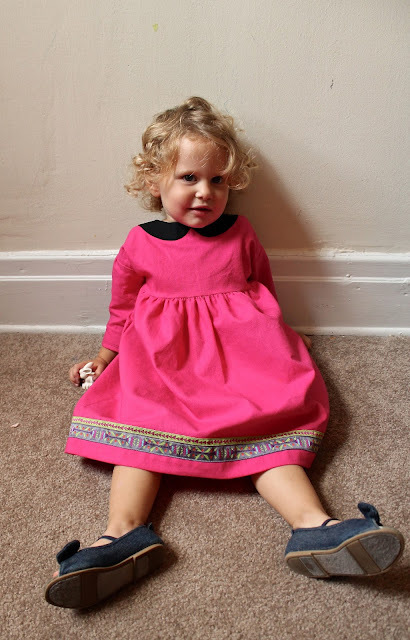 I am really in love with this outfit and Elsie's new Playtime dress as well. To make it happen, I simply changed the front facing pattern piece to that peter pan shape, and then cut 2 of them out of the black fabric, plus 4 of the back facing. I decided to still interface one set of the facings, but if I did this again, I wouldn't. It's slightly too heavy, and made it a little more difficult to do the buttons and buttonholes on the back. Anyway, you then sew the two sets of facings together around the outside curve, turn it right side out, and then sew the right side of it to the wrong side of the bodice. Then you turn it to the outside of the dress, understitch the seam allowance, and topstitch around the whole thing from the right side. As soon as I finished that part, I realized I should have sewn my shoulder seams differently. In the picture above, you can see that the seam allowances stick out right up the collar. (And I have no idea why I didn't finish them all the way to the edge.) What I should have done is the same thing you do when you sew the outside facings on the Class Picnic shorts. So next time, I'll sew the inside inch of those shoulder seams wrong sides together, then switch to RST for the rest of the seam. That way, the seam allowances will be hidden under the facing on the outside. So I just explained way more detail than most of you probably need, but would anyone be interested in a little picture tutorial for this modification? We could probably make it happen. Elsie must be getting annoyed with all the technical sewing talk. We should move on! 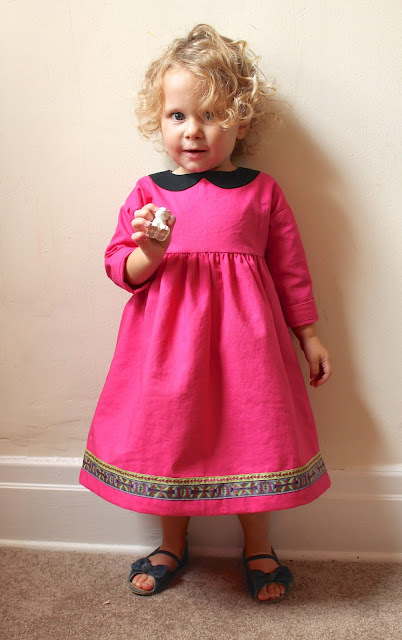 The fabric is a gorgeous Robert Kaufman linen from Sewn Studio. As lovely as it is, I doubted my choice here more than once. I mean, have you ever seen me use so much pink? I don't use it for Elsie's clothes even in normal garden varieties, much less electric shocking pink. In the end, I love the color. Sometimes you just shouldn't fight the pink. I also worried that it would look too wrinkly, but I love the way it drapes in this dress, especially on that full gathered skirt. It needed an extra something, so I added two beautiful ribbons from Sewn around the bottom. We have so many new ribbon designs in the shop and I couldn't wait to use them on the perfect project. I love the way they cover up the stitch line on the hem and almost look like one ribbon instead of two. The back has three simple white buttons, which I only chose because it's what I had on hand. But the contrast on the black turned out nice. And I love the shape of the those back facings on the outside as well. Elsie has strep throat and grew tired of this photo shoot very quickly. But she didn't want to take the dress off! She absolutely loved it, I'm guessing because of the easy shape and super-fun color. I can't wait to sew another one in knits with fun leggings to match. It's such a great staple pattern to have for fall, and I imagine this particular dress will be making an appearance on this year's pumpkin patch portraits. To see just how versatile the pattern is, definitely checkout Cherie's adorable knit version of the tunic and leggings. I can't get enough of that Yuki. You can buy your own digital or paper version of the Playtime pattern from the Oliver & S website. Just like in the spring, Liesl was kind enough to send the new patterns to Cherie, Kristin, Gail and I a little early so we could have some fun with them. We'll be rolling out our results all week, so keep your eye out for more! Just when I thought I was getting back into the swing of blogging, Hendrix stuck a big magnet on our Macbook and we had to get a new hard drive. We lost some pictures. And other things. Don't cry for me though, it's just stuff. We still have plenty of pictures of the important things. (kids.) But for now, I just have a few instagram shots to show you some things I've been making. You can follow me at @alittlegressica if you are on IG. 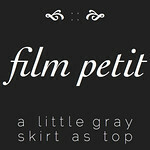 I've been working on a new scrappy project on and off throughout most of the summer. 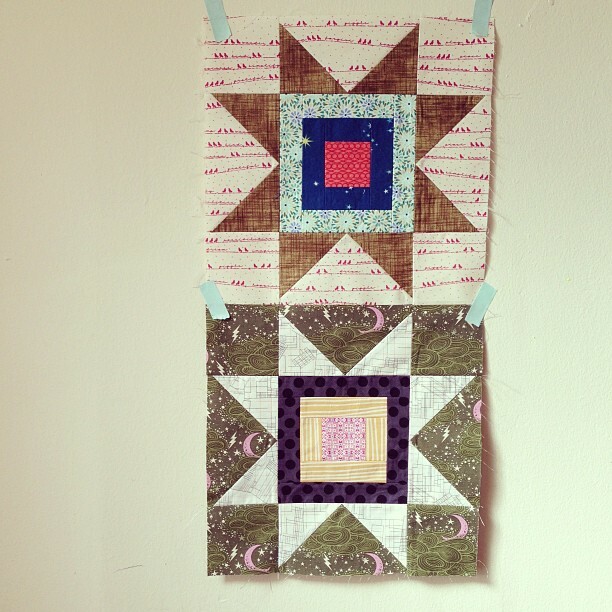 I've made 30 of these stars, all mostly from scraps and each block with it's own story. It's an adaptation of Elizabeth Hartman's Superstar pattern from her first book. Now the top is actually all done and I love it so much that I'm fretting about the quilting. Quilting anxiety! I made this large tote for my mom. She works in a school and is always toting things there and back and forth to church. And she deserved something new and something in her favorite color, just because. The outer and lining prints are from Amy Butler's Cameo line, which I got at Sewn Studio. The contrast bottom is a very nice lightweight denim by Robert Kaufman. 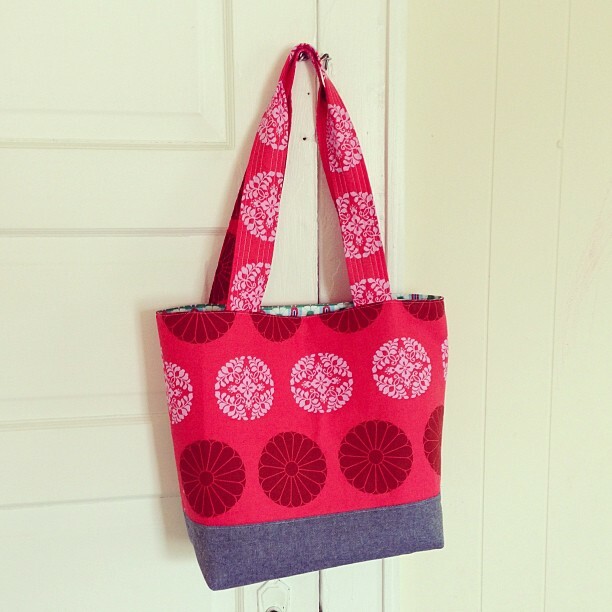 I kind of just looked at some pictures of totes and made up my own design. It's nice and sturdy with shapeflex and fusible fleece inside, plus a panel of Peltex in the very bottom. And I made these zipper pouches for Hendrix's triplet friends that just started Kindergarten. Is there anything cuter than kids starting Kindergarten? 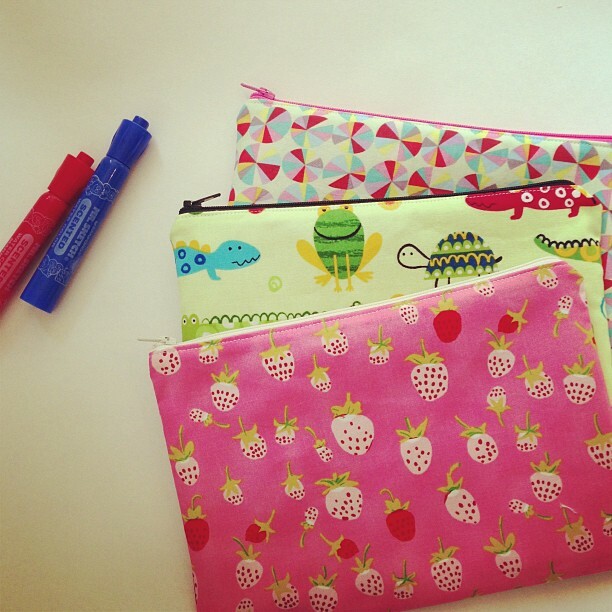 No better occasion for cute pouches. Now that our computer is sorted, I'll try to get some proper pictures of another quilt I just finished and some other projects. And coming up next week, I get to share some really fun things I've been working on along with Kristin, Cherie, and Gail. DREAM TEAM!